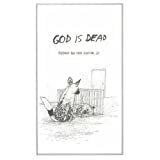 Ron Currie's God is Dead is a collection of connected stories set in the same world, which is not very different from our world. It starts off in Darfur, during a visit by Colin Powell and a visit by God in the form of a young Dinka woman. God here is not omnipotent; far from it. He is vulnerable and at the mercy of the murderous Janjaweed. The woman meets Powell, who does not realize she is God, and is more concerned with his own personal problems. The second story moves to the USA, where most of the rest of the stories are set. A high school senior has just graduated, and is ready to move on with her life, and is ready to do away with everything that she has cherished up to now. The third story has a group of young men killing each other because the world is in chaos and there are no reasons to live, now that God is dead. They do it as a challenge or dare, and partly because of solidarity since they have known each other for years. In one of the strangest stories, we meet a therapist whose job it is to get parents to admit that their children are not special: he has government authority as the Child Adulation Psychiatrist. His job is essential because life had become chaotic due to people becoming too obsessed by doing what their children wanted. He is the most hated man in town, but people have to go to sessions with him. He lives in a fortified house to protect him from the townspeople, and he feels the same need to worship children as his clients. In another story, a teen boy argues with his mother about his life and values. He is pressured at school to join the army and defend his people, the Postmodern Anthropologists, against the warmongering Evolutionary Psychologists. These stories are dark, often violent, with an undercurrent of absurd humor. The question at the heart of the book, what would happen if God died, is a provocative one. Currie's answer seems to be that our need for violence would be transferred to battles between different groups, and our neuroses would take on different forms. Thus his view seems to fit with Freud and Sartre, that human violence is inevitable. These stories, which keep the psychological dynamics in this fictional world very similar to those of ours, are quite believable within the set up that Currie provides. The unabridged audiobook is performed by Gabriel Baron. The reading is a little flat in places, but it has enough energy to carry it through, and better to err on that side rather than to overdo the bizarreness of the stories. It's an enjoyable performance of a work that will stay in the memory.